Don't let traffic get in the way of your weekend plans. KCBS Radio's Bob "Major Timesaver" Pryor helps you get to (or around) the Bay Area's biggest and best weekend events. Plus, the Major offers you suggestions for navigating the coming Monday morning BART schedule changes. Don't forget that we broadcast traffic updates every 10 minutes "on the eights" on 106.9 FM and 740 AM or you can stay up to date by following @KCBSAMFMTraffic on Twitter. It’s a time of tradition and festivities this weekend as Bay Areans celebrate the Lunar New Year, the joy of books, and the pleasures of being a San Francisco Giants fan. Meanwhile, a new wine-tasting festival comes to the North Bay and a new/old festival debuts in San Francisco’s Chinatown. Finally, we switch gears and talk about a completely different topic: The substitution of buses for early-morning BART service that begins on Monday (yes, this Monday, February 11), as BART goes to a 5:00am start time. If you normally take one of those early trains, scroll down to BART’s "5am" Start Time Plan for a quick précis of things you’ll need to know. Special Weekend Note: Caltrans’ maintenance crews and structural engineers have made temporary repairs to the Richmond San Rafael Bridge Deck following Thursday’s falling-concrete problem. At this writing, Caltrans is working on an emergency order to get a contractor to make permanent repairs to the Bridge this weekend. Since those repairs may necessitate lane closures, be sure and listen to KCBS and follow @KCBSAMFMTraffic before you head to the Bridge! Fri, Feb 8 at 3pm; Sat, Feb 9 at 11am and Sun, Feb 10 at 11am: San Jose: Vietnamese Tet (Lunar New Year) Festival at Eastridge Mall. Live music and entertainment, lion and dragon dance, Miss Vietnam California, carnival rides and games, etc. Pro tip: Tucked into the area bounded by Tully Road, Quimby Road, and Capitol Expressway, the mall is easily accessible by car or by bus and even features its own VTA bus station, the Eastridge Transit Center, with its own Park and Ride Lot. Three-day festival takes place in the Sears lot. Areas and roadways affected: Possible extra traffic on Tully, Quimby, Capitol Expressway; minimal impact on Hwy-101. Fri, Feb 8 at 3pm; Sat, Feb 9 at 11am; Sun, Feb 10 at 11am: Oakland: The 52nd California International Antiquarian Book Fair takes place at the Oakland Convention Center and Oakland City Center. Event features the collections and rare treasures of nearly 200 booksellers from over 20 countries. Free admission if you can show a valid student ID. Pro tip: For many, the easiest way to get to the Book Fair will be to hop on BART and get off at the Oakland 12th Street/City Center station. This location is also a stop for several AC Transit bus lines (6, 19, 20, etc). If you took the ferry to Oakland, a free Broadway Shuttle runs from Jack London Square to Grand Avenue, a one-block walk from City Center. Areas and roadways affected: Probably the only detectable effect will be that finding street parking might be even tougher than normal. There’s a sizeable lot behind the Oakland Marriott City Center (entrance on Clay Street between 10th and 11th Streets) and several public garages. Bring money. Sat, Feb 9 at 11am: At Redwood City’s Courthouse Square: 9th Annual Lunar New Year Celebration featuring lion dancers, martial artists, taiko drummers, and other live performances. Takes place rain or shine and includes free admission to the San Mateo County History Museum. Pro tip: BART doesn’t make it this far down the Peninsula, but Millbrae is a handy place to transfer from BART over to CalTrain, and from CalTrain’s Redwood City station, it’s a quick 2-to-3-minute walk to Courthouse Square. Several SamTrans bus lines also serve the Square, and if you’re inclined to drive, Redwood City doesn’t lack for downtown parking garages. Areas and roadways affected: In Redwood City: Possible extra traffic in the vicinity of Broadway, Middlefield Rd, Marshall St, Hamilton St (i.e., Courthouse Square). 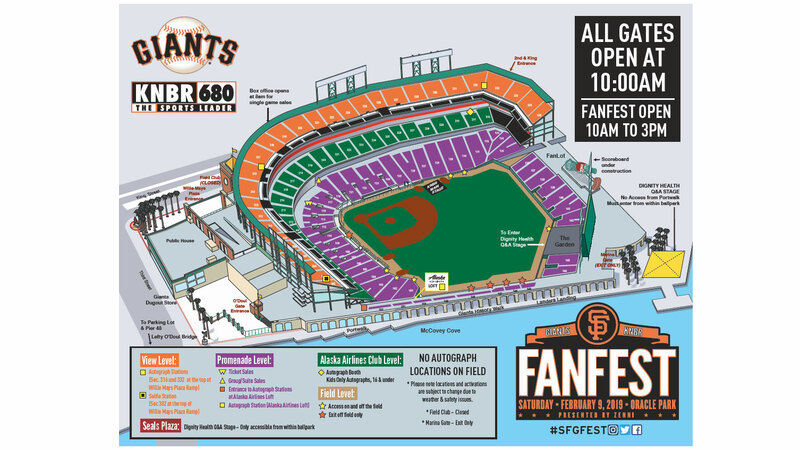 Sat, Feb 9 at 10am: Oracle Park: San Francisco Giants FanFest happens, rain or shine. Starts with a 10am ceremony in which late Giants former managing general partner Peter Magowan’s name will be added to the Wall of Fame. There will be a Q&A Theater (media conducting live interviews with players and coaches) at Seals Plaza, and players, coaches, alumni, broadcasters, etc. will be signing autographs at designated locations. Be aware that lines will be long for autographs and at Selfie Station, where fans will have the chance to take a selfie with players, coaches, alumni, etc. Pro tip: As always on weekends, northbound CalTrain service will take passengers as far as Bayshore Station, where express buses will continue to 4th and King Streets, one block from Oracle Park. In addition, CalTrain will run one extra train on Saturday, leaving San Jose at 8am and arriving at Bayshore at 9:30am so passengers can be at FanFest by 10:00. Of course, MUNI’s N-Judah line provides weekend service along the Embarcadero to Oracle Park. Unfortunately, the E-Embarcadero line is not running, due to the ongoing UCSF Mission Bay Platform Project. For the same reason, the T-Third line is operating on buses, but that’s still better than trying to drive and find parking. Areas and roadways affected: In San Francisco, avoid the area of King Street between 3rd and 2nd Streets; and be watching for extra pedestrian traffic in the whole ballpark area. Sat, Feb 9 at 10am: San Francisco’s Chinatown rolls out a new event this year, “Choy Sun Doe Day” on Grant Avenue between Jackson Street and Broadway. There will be performances, food, a petting zoo, and, at 12:28pm, a hundred Choy Suns will arrive and hand out to children red envelopes (“Lai Sees”) containing a chocolate gold coin (some envelopes will also contain money or a voucher for a toy). Pro tip: This event is in the heart of Chinatown, and if you’ve ever tried to drive or park in Chinatown on a busy Saturday afternoon, you know why MUNI exists. Those seeking good luck and prosperity can take the 8 Bayshore, 10 Townsend, 12 Folsom/Pacific, 30 Stockton or 45 Union/Stockton to the general area of the festivities. Areas and roadways affected: In San Francisco’s Chinatown, the two blocks of Grant Avenue between Jackson Street and Broadway. Sat, Feb 9 at noon: Rohnert Park: The first Wine Country Distillery Festival takes place at Sally Tomatoes (the event center at 1100 Valley House Drive, just off Petaluma Hill Road at the old Hewlett Packard campus). Features wines from 18 distilleries, food vendors, a cocktail contest, music, etc. Full information and tickets available at winecountrydistilleryfestival.com. Pro tip: There’s ample parking at the venue and Designated Driver tickets are available for purchase. Website says “Uber and Lyft credits” will be available on the day of the event. Areas and roadways affected: In Rohnert Park: No impact likely beyond some extra traffic on Valley House Drive. Mon, Feb 11: BART is going from a system-wide start time of 4am to a system-wide start time of 5am in order to speed up a massive project that will seismically retrofit the Transbay Tube. That project will likely take three-and-a-half years. In the meantime, the primary impact of the later start time will fall on the approximately 2,900 riders who have been entering BART during the 4am-5am hour – BUT riders should be aware that the “5am start time” applies to trains at the end-of-the-line stations (and some mid-line stations). Uncertain what time that first train will show up at your station? Here’s what you do: Go to BART’s Trip Planner, plug in any date from February 11 onward, give it your starting station and ending stations, and then click the Search button. If a bus icon shows up in the results, that’s an Early Bird Express bus. If the Early Bird bus comes too early for you, click the Later button (you may need to click it a few times) in order to see when the first actual BART train arrives. The earliest East Bay train, for example, will arrive at San Francisco’s Embarcadero Station at 5:35am. A link to the Early Bird Express Bus Schedule. An explanation of how Express Bus payment will work (Short version: You can pay with either cash or a Clipper card – but if you use Clipper, you will have to have cash loaded onto the card; the buses don’t recognize the High Value Discount (HVD) you may have on your card. Also, if the agency operating your Express bus is Golden Gate Transit [and yes, GG Transit will be operating some East Bay buses], you’ll need to tag on and tag off in order to avoid being charged the maximum fare). Station-specific guides (including information on which agency is operating your Express bus service and the stop times). A listing of stations that don’t have Early Bird Express bus service. An explanation of how Early Bird passengers can pay for parking, given that the stations won’t be open until 5am, when BART service begins. (Short version: You can: 1] download a BART parking app; or 2] purchase a single-day parking pass online; or 3] purchase a single-day “hang tag” pass from the Lake Merritt or Embarcadero Clipper Customer Service centers.) You’ll also need to be sure and park in the FEE area of the station, not the PERMIT area. Those are the basics. You can also get help from BART's Transit Information Center, where operators are available Monday-Friday, from 3:45am-6pm, at 510-465-BART (2278).